Did you know that chores aren’t just helpful for keeping your house in order and for teaching independence? Before my son was diagnosed with sensory processing, I never knew about all the great benefits of involving children in chores and “heavy work”. I am excited to share how we use chores in our home to help focus and calm our children and ease our son’s sensory needs. 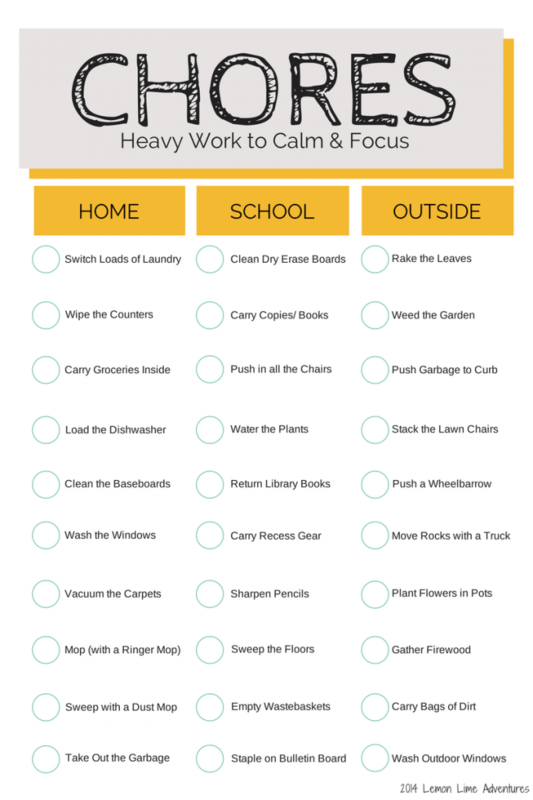 I have made a handy printable chore chart for home, school, and for outdoor heavy work. This list of chores isn’t meant to be done all at once, or even in one day. I have gathered as many examples of chores that provide “heavy work” to give you and your child options. The key is to remember that not all children are the same, and therefore will react differently to each activity. You will want to take the first few weeks introducing each chore and making sure your child is both developmentally ready and willing to complete the tasks. 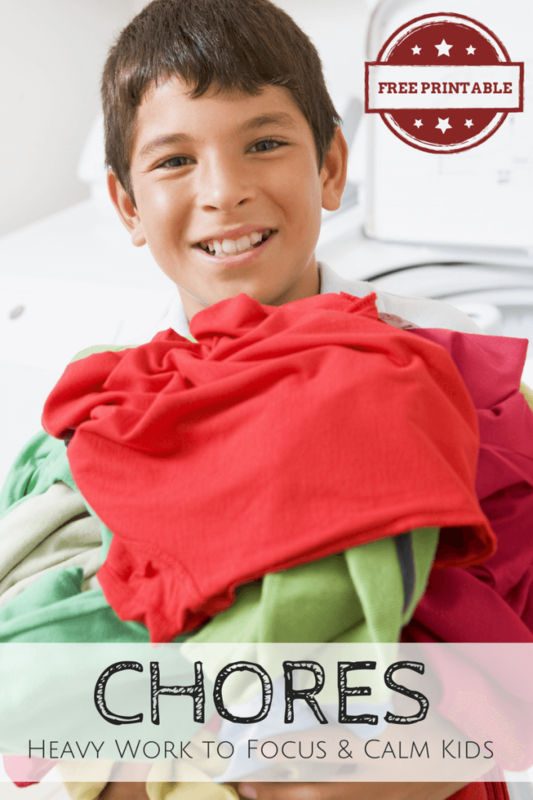 Teach the Chores | Don’t assume that your child knows how to do any of the items on the list. If you want to limit frustrations and make sure they are successful, do each chore on the list with your child until you know they feel comfortable doing them on their own. Small Doses | There is no reason to try to do all of the chores on the list. At the start of each day pick one to two chores that you will use throughout the day. Need a Break? Do a Chore! | In our house, often time while we are working on a “sit down” activity that requires focus and attention, we will take a short 5 minute break to do one chore on the list. Without fail, after a load of laundry has been changed over or the recycling has been taken out, the boys are ready and focused to get back to work. Click here to Download your FREE Printable Chore Chart! I am excited to be sharing over at Creative with Kids. 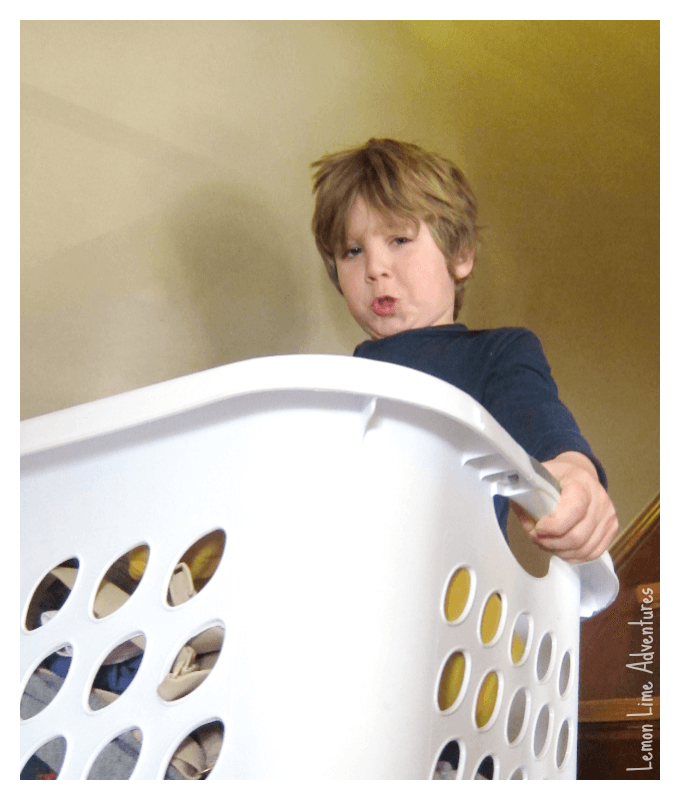 I am sharing 5 Sensory Activities to Help Children Focus through the use of “heavy work”. Do you have a special chore you love to incorporate in your day? What chores do you kids absolutely love? I would love to hear about how you manage chores in your house! I would love to hear! Connect with me on Facebook, Twitter, Google+, Pinterest, Instagram or subscribe by email. I can’t wait to hear your ideas. I love this list, Dayna! Now that summer vacation is almost here, I’m also thinking the boys and I can set up some sort of relay race in the driveway in which we’re carrying buckets of water. I could use the exercise, too. Unrelated sensory question: My 6-yo comes home from school and jumps on the living room furniture (couch to loveseat to coffee table to chair, etc.) I allow him to do it because it seem like he NEEDS to. Do you have any experience with this kind of behavior (or any better replacement activities)? You let them jump to get their energy out and structure it so that you turn to a game where he/she is learning too. example. I made cards up with words on then, laminated them and I will randomly place them around the floor and up the stairs. (Or you can buy already made flash cards at dollar store). I will say find a word that starts with the letter sound, or rhymes with, or another word that means the same as…. They then need to run about and stand on their match and collect it. It can be a race with more kids. Oh this is such good timing! I’m planning to write up a chart for my nearly 6 year old to start doing some chores around the house. Just small stuff to start with like laying the table and putting his clean clothes in the drawers. I thought writing it out would make it ‘official’ so that he won’t complain when I tell him (he’s quite keen on the idea.) Now I just need to get on with it! That is a great idea. We also have a visual chart in our family command center for our chores. The boys pick which ones they want to do and then put them on their chart. They have to pick at least one to do for the week. I hope to share it soon since it is printable as well! We have this on our fridge as a quick guide for us. I’d be keen to see this. It is available for download on this site. Fantastic! So glad this is helpful! This is exactly what I needed. Thanks, Dayna. This is BRILLIANT! I have described this to parents and teachers for years. Thank you for coming up with this valuable list. I”m sharing it with Kirk Martin @ Celebrate Calm today and on the New Teachers Pinterest board. Probably more places too. Wow! Thank you so much for all your kind words! I will have to check out Celebrate Calm. Have you checked out our other calming posts? I find this is a similar idea to kids I have worked with in the school. when I see they are losing focus, I have them stand up and touch their toes and reach for the sky and other various exercises. They can usually focus again. I always get asked why I had them do that. I shrug my shoulders and say just for a change. I learned these strategies having a daughter who is very energetic and can lose focus when sitting for too long. I also get my daughter to do fun, hopping, jumping exercises or run around the furniture. each lap she stops and I ask her to spell a words from her word list. Her brain shuts down when she sits too long. The article makes sense. I love your info! Thanks for sharing! I’ll be using some of these ideas with my son, who has borderline sensory disorder. I see some things that I can use won’t him. Thanks again! Amazing ideas! It is really difficult to calm kids, especially when they are boys. I have two boys and a girl. They are all very energetic and playful! I am trying to calm them down and teach them to be responsible, but sometimes I have troubles with that. Giving them personal cleaning checklists and chore charts is part of this and I believe that for now it works! Thanks for the lovely ideas and the wonderful chore charts!